Our clients need audio for a variety of events: some need a simple wireless microphone and loudspeakers for 150 people at a wedding, while some need concert audio with line array and full monitor rig for a national act. 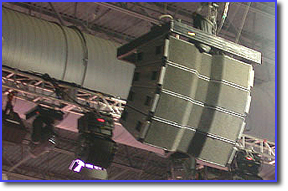 Whatever your event needs are, we can offer you audio systems scaled to fit your purposes. From line array, to trapezoidal speakers, wireless microphones and monitor rigs, we have it in our warehouse and are ready to deliver to your event site! Get a Free Quote and we will contact you soon. We look forward to working with you!